The first Battle of the Marne was fought from 5-12 September, 1914. It was the turning point of the opening campaign in what would be known as the Western Front during World War I. First Marne represented the death of German hopes for a repeat of 1870 and ensured that Germany would have to face every German planner’s nightmare for over a century, a two front war. The Schlieffen Plan was supposed to allow Germany to defeat her two great enemies, France and Russia, one after the other in sequence. The greatest flaw in the Schlieffen Plan was actually the plan itself. It was an attempt to move huge masses of men on foot against France fast enough to outflank and then destroy the French. The plan seemed to ignore the fact that the French would have the advantage of interior lines and undamaged modes of transport to move reserves and fresh troops to where they were needed. It also ignored the fact that trains move faster than men and seemed to trivialize the logistic difficulties in supplying those armies once they left the railhead. The initial invasions went swimmingly for the Germans. Except for a tactical/strategic withdrawal in Alsace, the Germans were driving all before them throughout August and Moltke can almost be forgiven for thinking that the plan would work. Then reality stepped in and slapped the Germans in the face. That reality was 1st Marne and the amazing turnaround of the French Army and BEF who had been defeated continuously for the past month. That stopped on the Marne. 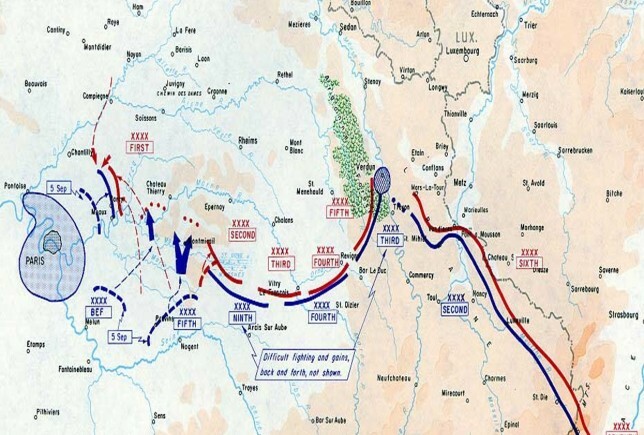 As the German armies continued their advance deep into France the plan changed, as plans are wont to do in wartime and as von Moltke had remarked upon the mid-19th century. 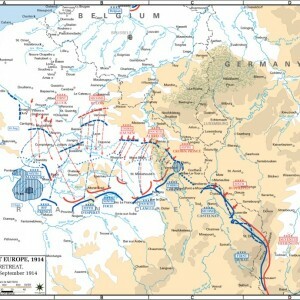 The German armies continued to slip further left (east) of their planned routes of March as they advanced into France. They slipped so far that the 1st Army on the German right flank ended up moving north of Paris instead of south of it. As they did so, the distance between armies increased. Toward the end of August the Germans attempted to rectify this and in the process opened up the gaps between armies even bigger than they were as the armies did not maneuver in a coordinated fashion. These gaps are what the Allies used to their advantage in their riposte at the Marne. As von Kluck’s 1st Army passed Paris he exposed his right flank to the French, who attacked and disrupted him. Von Kluck backpedaled and in so doing he opened a gap of almost 60 miles between his own 1st Army and Bülow’s 2nd Army on his left. The BEF attacked into this gap and forced the armies farther apart. 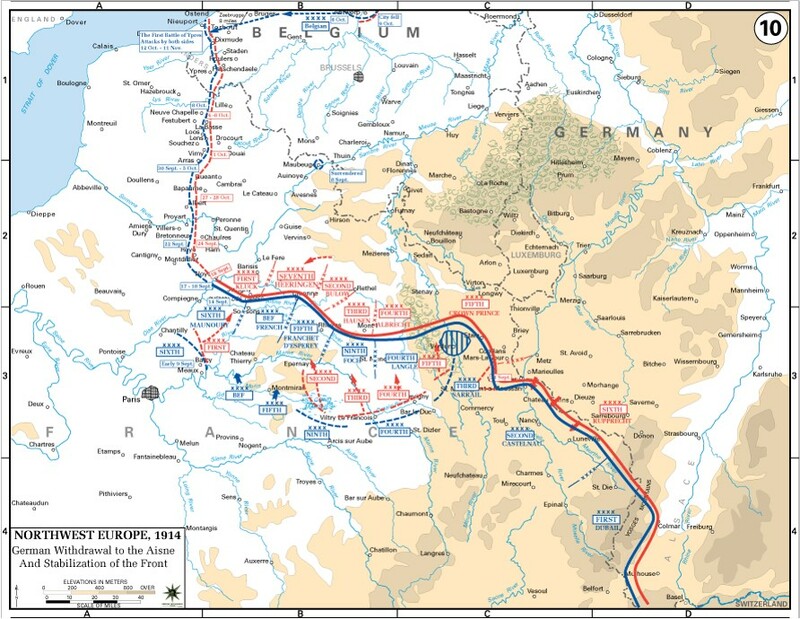 Despite strenuous efforts the Germans were unable to close the gap and forced to retreat to consolidate their lines. By 9 September, the Germans were either retreating or attempting to hold all along their line in the face of the shock from the unexpected combined counter-attack. It did not help that about this point Moltke, the German Chief of Staff, started to have a mental meltdown and would eventually be fired and replaced in late October, 1914. By 12 September the German advance was stopped and this is traditionally the day assigned as the end of the battle. During the rest of September and throughout October the “Race to the Sea” was fought as the Germans and Allies fought a series of battles to the north and west in futile attempts to outflank their respective enemy and bring the campaign in the west to a decisive conclusion. This “race” ended at the 1st Battle of Ypres in late October when the BEF stopped a last ditch offensive attempt in and around the towns of Ypres and Langemarck in the sliver of Belgium that remained in Allied hands. 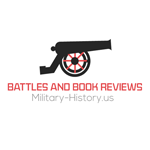 Casualty numbers for 1st Marne are actually pretty general and not specific at all because the battlefield was so fluid and the dates for the battle were not generally agreed upon by historians until the mid-1930’s. The French and British suffered approximately 250-275,000 casualties at First Marne with about 100,000 of those being dead. The Germans suffered roughly the same number of casualties. The equality of casualties regardless of whether a side was on the offense or in the defense was to be a recurring theme throughout the war as both attacker and defender suffered roughly equal casualties in any given battle. This was even true at such momentous battles as the Somme and Verdun in 1916. 1st Marne was the end of the German dream of overrunning France and bringing a new continental war to a swift conclusion. 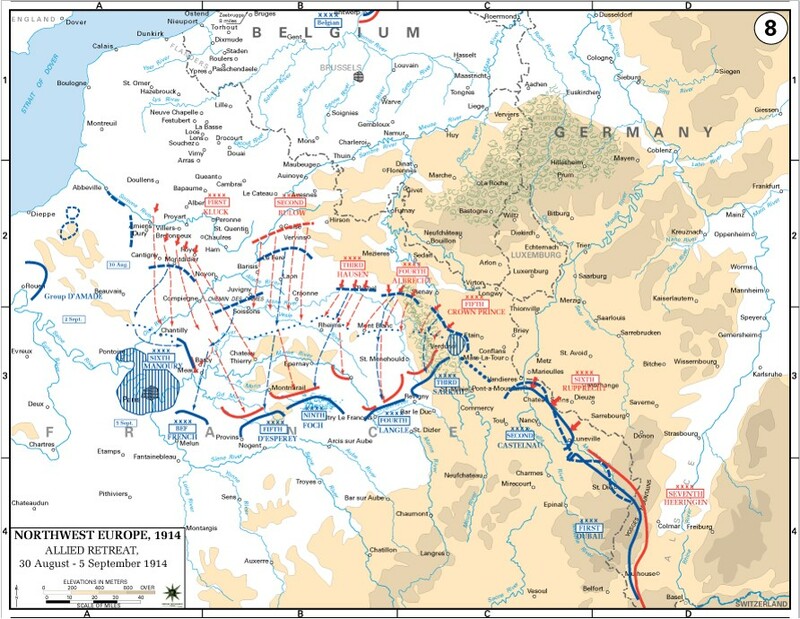 The Schlieffen Plan failed for several reasons but the most important were that it tried to do too much, the logistics of the time were unable to meet the needs of the forces in the field in any type of timely manner, poor communication from division to corps to army to theater on both sides but this hampered the Germans more. I don’t buy the theory that says if several divisions had not been detached to East Prussia by Moltke then Germany would have defeated France. Nine infantry divisions would not and could not have been decisive. The plan was doomed to failure from the start for the reasons stated above. Quite simply, doctrine and capabilities were not up to the challenge of waging modern warfare with the speed and rapidity required for one mass army to defeat another. All Maps courtesy the Department of Military History at West Point.